A lady must never let on who she is at the masquerade ball. She needs to give a sense of style in her bedazzled look. Perhaps take on a persona of a completely different person. What ever she is doing it's key to make all those folks wonder who is behind that mask? That can be done with the Adult Venetian Showgirl Lace Mask. Dance the night away knowing your identity is safe. The lace mask is held in place with eyeglass-type temple pieces. 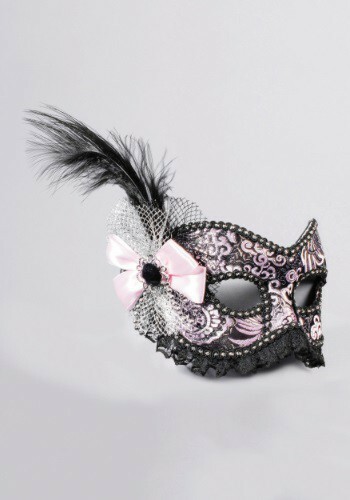 In Venetian style the mask is edged with a braid, accented with a bow, feather, and lace for a feminine look. The molded eye mask has a tapestry like fabric on the outside, and soft felt on the inside.